Smartphones – especially high-end ones – are primary targets of ‘mobile snatchers’ today, and because of that it is really important that you take some precautionary measures to ensure that, ideally, your device doesn’t get snatched and if it does, your data doesn’t get misused. That’s where “anti-theft” apps come in. There are two kinds of them: the ones that help you secure your data and identify the snatcher after your device has been stolen and the ones that work to stop the incident from happening in the first place. The app we’ll be talking about in this post is of the latter kind. Check it out after the jump! Developed by Ziad Khouri, Ripcord Alarm is an app for Android which alerts you whenever your device is unplugged from a power source. Wait, how does that help you increase security? Well, consider this: with the terribly short battery life these Android smartphones come with, it’s not unusual to find people carrying spare batteries or an extra AC charger. Now, when you charge your device at a public place, it’s very easy for someone to get hold of it without you ever knowing it. That’s the situation the developed had in mind when developing Ripcord Alarm. All the app basically does is sound an alarm whenever it detects that your device has been unplugged. So, if someone does indeed unplug your device and attempt taking it away from you, everyone at said public place will take immediate notice of it because of the obnoxious alarm tone. Said snatcher will then produce a pistol from a pocket, hold you at gunpoint, make you enter your PIN code and run away with your device or, if you’re lucky, they’ll just run away in shame. 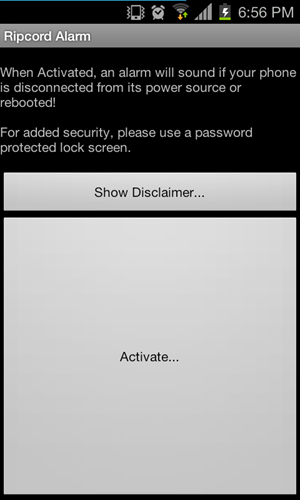 To further enhance security, the app will also trigger the alarm if your device gets rebooted while it is activated. These are the uses of Ripcord Alarm. Another potential use I could think of revolves around a situation I very regularly face at home. I have a strong habit of always charging my Android smartphone during the night. This way, I get a fully charged device in the morning and don’t have to worry about it running out of juice in the middle of the day. However, I have a little brother who has an equally strong habit of taking away my device at night to play games on it. He often forgets to re-plug the phone and so I wake up to a not-so-fully charged device. With Ripcord Alarm, I can ensure that my device doesn’t get unplugged during the night in the first place. If it does, I’ll be informed of it and then I’ll be able to re-plug it myself. We do have one gripe with the app at the moment: its default alarm tone is, well, a little too alarming. We’d like it if the app presented more variety or let us choose a slightly more softer tone. 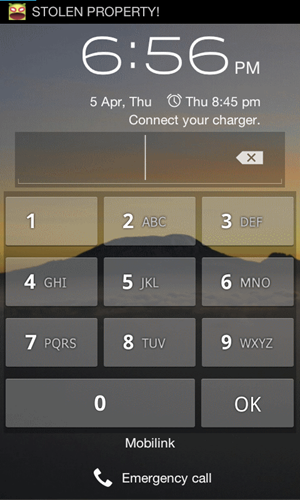 Ripcord Alarm is available for free and can be download from the [Google Play] Store. Be sure to tell us what you think of Ripcord Alarm by leaving a comment over on our Facebook and Google+ page!